Many chrome users are facing a similar issue, and they don’t know the exact solution to this problem. So, today in this guide I’ll guide you step-by-step how you can solve the problem when you see this message often popping up on your screen. Before I list down the methods, here are some causes which make your chrome browser unresponsive. A lot of Open Tabs: There are high chances of your chrome browser crashing again and again due to a ton of tabs open simultaneously. Outdated Browser: If your browser is outdated then possibly you might face issue with your browser constantly crashing. Let’s now quickly jump into the methods that can prevent your browser from crashing. Sometimes, when you install any unwanted chrome extensions which are not trusted, then it might create some clash with the browser, and eventually, your browser will crash. Step 1: Search for the Menu button in the top right corner and click on it. Step 2: Next, find out the “More Tools” tab. Step 3: Go to the “Extensions tab.” Here you’ll see all the installed chrome extensions. Step 4: Lookout for all the extensions which you are not using and remove them. In our life, half of the problems are solved after clearing the cache. So why not give it a try for this as well. Step 2: Find out the “History” option. Step 3: A new window will open in that select the “Clear Browsing Data” option. Step 4: Close your browser and open it again. This will potentially solve the chrome unresponsive error. Most of the problems are solved automatically when you keep your software up-to-date. However, certain times we overlook it and forget to update the software to their latest available version. But, just by updating the software to its latest version you can get rid of half of your problems. Step 3: You will find a dropdown, click on the “About Google Chrome” option. Step 4: It will automatically, check for latest updates. For some reason, if it’s not updating automatically then you have to update it manually. Step 5: Cross-check the latest version of your browser by searching the version on the Internet. It’s good to have this option enabled as it helps Google collect your data and predict the overall experience you are having while using Chrome. However, this sometimes results in throwing Google is unresponsive, relaunch now an error. Step 2: Open the “Settings” Tab. Step 3: Scroll down and click on “Advanced” option. Step 4: You’ll now see a Privacy and Security section wherein you have to find the “Automatically send usage statistics and crash reports to Google” option. If by default it’s enabled kindly disable it. Step 5: Restart Chrome browser, and hopefully you won’t see the chrome is an unresponsive error again. Sometimes if you see sudden crashes in your chrome browser, you need to go to Task Manager and close all the other processes that are running for Chrome. 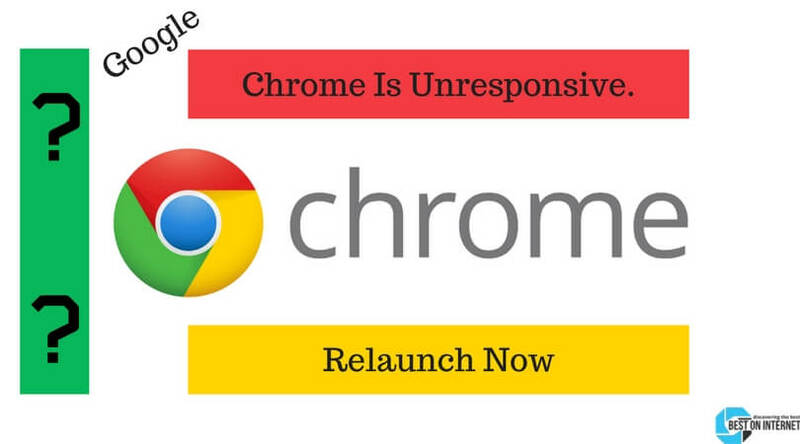 It can be one the reason for your browser to show you the chrome is unresponsive, relaunch now error. Step 2: A new window of Task Manager will open. Step 3: Find out all the Google Chrome processes that are running in the background and kill them by right-clicking on it and selecting the “End Task” option. Step 4: Restart the browser and check if the error goes away. I hope with this five method you must have resolved your chrome is an unresponsive error. If you are facing any difficulties in executing any of the methods mentioned above feel free to comment down below. Also, do let me know which method worked for you. If you found the information useful, then share with others who are facing similar issues.